We had an exciting Hindustani Classical Music Vocal Recital featuring Usha Kallianpurkar this August 2015. True to the old style and without any gimmicks often employed by commercial artists, Ushaji brings a purity and beauty to her ragas. Born in Mumbai to a music-loving family, Usha Kallianpurkar was encouraged to learn music at an early age. She had been given initial lessons from Pandit Kamlakar Bhagwat and Pandit Durgesh Chandavarkar; both are well known as capable teachers with a specialization in light classical genres. She began her training in Hindustani classical music under the guidance of Mrs. Sudha Divekar and Pandit Firoz Dastur (guru of Mrs. Divekar). Her rigorous tutelage with Pandit Dastur lasted until 1993, when she moved to the United States. She presently seeks guidance from Pandit Madhav Bhatki, a gifted composer, teacher, and an exponent of the Gwalior ‘gharana’. 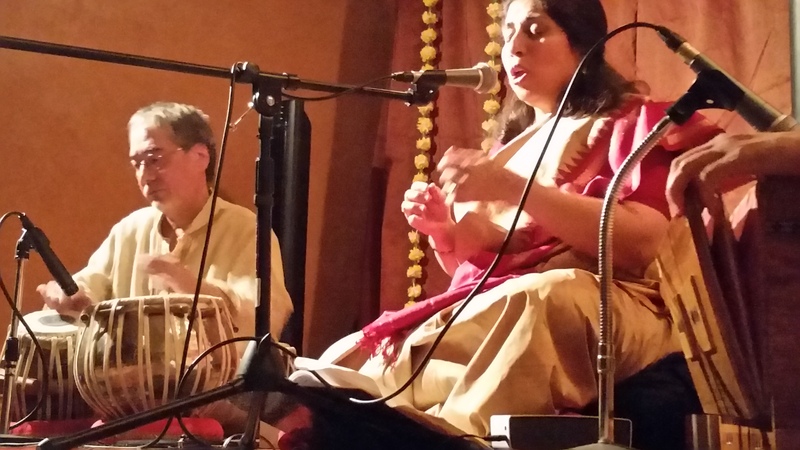 Usha has won critical acclaim for her performances at established music circles in India and in the eastern United States. In addition to the many Hindustani ‘Khayal’ concerts in the United States, her collaborative forays into other vocal art forms have culminated in performances at the Ravenia Music Festival in Chicago, the Kaye Playhouse, the Lincoln Center, and the United Nations in New York City. She has also collaborated and performed with Jazz vocalists at the Museum of Natural History’s Festival of Asia and, recently, at the prestigious Birdland Jazz Club in New York City.